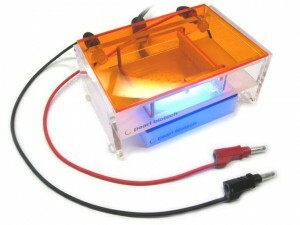 This electrophoresis gel box is open hardware - you can build one on your own. Sure it takes years of training to become a world class biologist, but now you can have fun with their equipment without slaving away in academia. Pearl Biotech is selling an electrophoresis gel box, an instrument used in the separation and characterization of DNA online. Electrophoresis is a safe procedure that is useful to molecular biologists but can be enjoyed by anyone. It’s a standard experiment in high school labs. The Pearl Gel Box is an open hardware device which means that anyone is free to build or adapt it as along as they share their modifications in a similar manner. Pearl Biotech sells a fully assembled version for $200. By providing a cheap entry level tool for genetics Pearl is helping generate interest in the field and supporting the do it yourself community. The concept of an open hardware electrophoresis gel box was discussed on the biology wiki OpenWetWare. Teams in the International Genetic Engineered Machine competition (iGem) and members of DIYbio.org both saw the need for and the benefit from having a cheap version of this often used tool. If you’ve worked in molecular biology you’ve used an electrophoresis gel box. While the Pearl Gel Box itself is pretty cool, the more impressive development here is that a community of amateur and professional scientists got together on an open forum, decided what kind of tools they needed, and someone then took the initiative and created one of those tools. This process is the sort of rapid response that makes an internet based scientific community so compelling. The Pearl Gel Box falls under the Creative Commons Attribution-share Alike 3.0 license. That means you can go and download the schematics and build your own without license infringement. Or you could just purchase one fully made from Pearl. Either way, any modifications you make can be shared with the community. In this way, the product could be continually refined and peer reviewed. Together everyone builds a better gel box. That’s the concept anyway. Looking at the discussion board on the Pearl Biotech website an enthusiastic community seems to be absent at the moment, but hopefully that will change. There’s a lot of self-motivated people involved in this example of open hardware. Pearl Biotech founders, Norman Wang and Tito Jankowski, were the ones to lead the discussion about an open gel box on OpenWetWare (in the DIYbio.org section). Their next project is an open hardware Thermal Cycler (used to amplify DNA using polymerase). As with any young community, those interested in open hardware for molecular biologists rely on the hard work of a few to serve as the hub for the interest of many. But that won’t always be the case. Open hardware is an interest generating paradigm. Each person who downloads or purchases a Pearl Gel Box is likely to use it many times and will undoubtedly refer others to it. In this fashion open hardware should grow in the same way that open source computer codes and wikis (open information) have grown. I’ve said it before and I’ll say it again: the great power of this information superhighway we all spend so much time on is the rapid exchange and review of ideas. When that power is harnessed in a focused way by a dedicated community, the outcome will be abundant productivity. Electrophoresis is just the beginning. Here’s a video of some DIY biologists trying to perform electrophoresis without a Pearl Gel Box. Cool, but very sticky.